A major theme of Dr. Beckett's research since 1987 has been the public health impact of chronic diseases of aging, especially Alzheimer’s disease (AD). She led statistical efforts for the first population-based estimate of the number of people with AD in the US: 4 million. 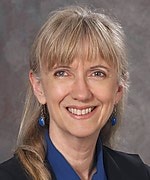 As Director of the ADNI Biostatistics Core, Dr. Beckett has also served as external advisor for 3 additional ADC’s and for the AD prevention initiative, the CAMD biomarker initiative, the NINDS Parkinson’s disease biomarker development committee, and the national Autism Biomarker Consortium for Clinical Trials. Dr. Beckett has a strong interest in Cancer Research. Her collaborations span the field from basic science to clinical trials to care-giving and community-based research. She has directed the UC Davis Comprehensive Cancer Center's Biostatistics Shared Resources since its inception in 2000. Dr. Beckett's work builds on strong mathematical training and an interest in applying discrete mathematical tools creatively to biomedical research. Jia Y., Chen, Y., Cress, R., Stewart, S., Harvey, D., Semrad, T., Becket. Mediating effect of post-surgical chemotherapy on presence of dementia and survival among patients 65 and older with Stage III colon cancer. Cancer Epidemiology, Biomarkers & Prevention. 2017. Wintemute, G., Beckett, LA, Kass, P., Tancredi, D., Studdert, D., Pierce, G., Braga, A., Wright, M., Cerda, M. Evaluation of California’s Armed and Prohibited Persons System: study protocol for a cluster-randomised trial. Injury Prevention. 2016;1-5. Satake, N., Beckett, LA, Novel Targeted Therapy for Precursor B Cell Acute Lymphoblastic Leukemia: anti-CD22 Antibody-MXD3 Antisense Oligonucleotide Conjugate. Molecular Medicine. 2016;22: 632-642. Beckett L, Nettiksimmons J, Howell LP, Villablanca AC. Do Family Responsibilities and a Clinical Versus Research Faculty Position Affect Satisfaction with Career and Work-Life Balance for Medical School Faculty? Journal of Women's Health. 2015;24(6): 471-80. Miller JW, Harvey DJ, Beckett LA, Green R, Farias ST, Reed BR, Olichney JM, Mungas DM, DeCarli C. Vitamin D Status and Rates of Cognitive Decline in a Multiethnic Cohort of Older Adults. JAMA neurology. 2015;72(11):1295-1303. Beckett LA, Tancredi DJ, Wilson RS. Multivariate longitudinal methods for complex change processes. Statistics in Medicine. 2004;23:231-239. Beckett LA, Tancredi DJ. Parametric empirical Bayes estimates of disease prevalence using stratified samples from community populations. Statistics in Medicine. 2000;19(5):681-695. Beckett LA, Brock DB, Lemke JH, et al. PMID: 8610686. Analysis of change in a self-reported physical function among older persons in four population studies. American Journal of Epidemiology. 1996;143(8):766-778. Evans D, Scherr P, Cook N, Albert M, Funkenstein H, Smith L, Hebert L, Wetle T, Branch L, Chown M, Hennekens CH, Taylor JO. PMID: 2233632. Estimated prevalence of Alzheimer's disease in the United States. Milbank Quarterly. 1990; 68: 267-289.